Stay at our hotel in Stillwater, OK and you'll be less than a mile from the Oklahoma State University campus & National Wrestling Hall of Fame. We offer comfort with all the modern amenities and a convenient location that is two miles from the Stillwater Medical Center and Boomer Lake Park. 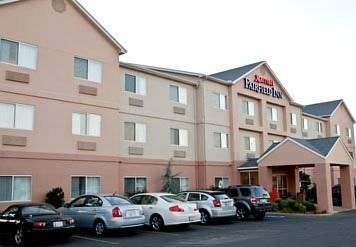 The Fairfield Inn & Suites Stillwater is a short drive from the leisure of Eskimo Joe's, Lakeview Pointe, Oklahoma WONDERtorium and Cimarron Casino. We are located close to many businesses including: Stillwater National Bank, Meridian Technology Center, Armstrong World Industries, ASCO Aerospace USA and Creative Labs. Allow us to make the comfort of your home as close to possible with our free Wi-Fi internet to help you stay connected, along with free breakfast daily, business center, fitness facility, laundry room and indoor pool. At the Fairfield Inn & Suites Stillwater, you're our #1 priority. We promise you'll be satisfied, or we'll make it right. That's our commitment to you. Ask us about The Fairfield 100% Guarantee. Unveiled in 1930, a 17-foot-tall statue of an Oklahoma mom strides across the prairie, holding the hand of her son. Museum showcases pioneer artifacts. Note: this is not a statue and museum of "The Pioneer Woman" on the Cooking Channel, although some visitors arrive thinking that it is.